Jacob Engelstein hating on bagels. 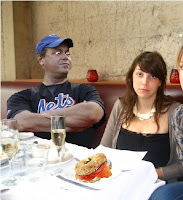 CHICAGO, IL - (@The Comedy News) - A wholesome breakfast between college friends Jacob Engelstein and Mara Brown came to a bitter conclusion after Engelstein began to proselytize about how bagels in his home town of New York City are better than all of the bagels made elsewhere. Engelstein was in Chicago for the weekend, visiting from his home town of New York. "You call dis a bagel? In New Yawk, we got real bagels," Engelstein said when Mara's sesame seed bagel with lox and cream cheese arrived at the table. "I only get bagels from Bagel Express on Third. Everyt'ing else is gahhhbage." Mara Brown, the Chicago-native who had to endure Engelstein's rants, said that throughout their time at Northwestern University, Engelstein would always find a way to remind everyone within shouting distance that New York City has the best bagels. "During sophomore year of college, Jacob was sweet enough to come to a shiva service for my grandfather who passed away," Brown explained. "But as soon as the bagel and veggie spreads were served to mourners, Jacob just went off. Ended up getting into a fist fight with my uncle Morty after mouthing off about the bagels being frozen, not fresh." Engelstein and Brown had plans of visiting Brown's favorite Jewish deli in Skokie later that afternoon, but Brown canceled. "After Jacob started explaining for the billionth time why the water in New York makes all the bagels and pizza better, I knew I could no longer take his smug parsing of non-New York food," explained Brown. "He's already knocked Chicago bagels, Chicago-style pizza, and even called my Rabbi 'reverend' to his face. I'm not gonna let him trash my favorite matzo balls in town." Shortly after parting ways with Brown, Engelstein ended up being detained at O'Hare airport for trying to sneak concealed canteens of New York tap water onto a plane.